Hob. Time: 6-8 mins. Hob. Rinse 100g couscous thoroughly in cold water. Bring 500ml water or stock to the boil in a large saucepan on the medium hob ring over a high heat, add the couscous. Stir, cover with a lid, reduce the heat to low and simmer for 6-8 minutes, until the couscous has softened but is slightly firm to the bite. Drain thoroughly, rinse and use as required. 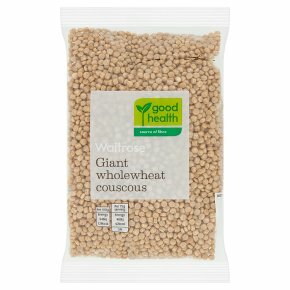 When cooked according to instructions 30g of uncooked couscous weighs approximately 75g when cooked.